On Saturday, I'm on the Digital Comics panel and then later the G.I. Joe panel. On Sunday, I'm presenting on "Breaking Into Comics and Staying In." 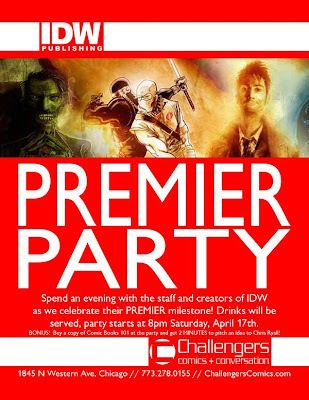 The really fun thing is on Saturday night at Challenger Comics. They're throwing a huge IDW party. Check out the invite here! Come on by and meet your favorite creators (me, I'm sure) and hang out with us! IDW does not have a booth at the show, so the rest of the time I get to float around, do some business and meet with freelancers. Meet with some other possible licensors and meet retailers (something I should do more of anyway). I'm looking forward to the trip. Giordano's is my favorite pizza place on the planet and my brother lives in Chi-Town. Looking forward to seeing him, too. If you happen to be at the show, come find me! Love to meet you. Comics Experience Class Does the Impossible!